MANNING, EDWARD, Baptist minister; b. 16 Oct. 1766 in Ireland, third son of Peter Manning and Nancy Carroll; m. 25 June 1801 Rebecca Skinner, and they had three daughters; d. 12 Jan. 1851 in Upper Canard, N.S. The family of Peter Manning came to Nova Scotia in 1769 or 1770 either directly from Ireland or, according to family tradition, after a stay in Philadelphia. The 1770 census lists him as a resident of Falmouth Township, at the head of a family numbering nine. Although born Roman Catholic, all the Mannings appear to have become at least nominal Protestants by the 1770s. In 1776 Peter Manning murdered a neighbour, the stepfather of the Reverend John Payzant*. For his crime he was tried, convicted, and hanged. Little is known of the Manning family’s life in the Falmouth area after the tragedy. Edward grew into a tall (6 feet 4 inches) and very strong young man, a good farmer, and an excellent woodsman; at the age of 16, armed only with a hatchet, he killed three bears. According to his own later account, he led a “riotous,” wicked life, although it was probably a fairly normal one for the times. 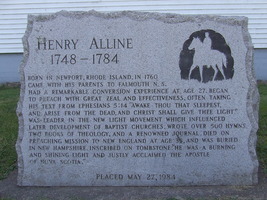 The Great Awakening, begun in 1776 and led by another Falmouth resident, the charismatic preacher Henry Alline*, had a tremendous impact on Manning. For the rest of his life he retained a vivid picture of Alline, with tears flowing, begging him to flee from the wrath to come. It was not until 27 April 1789, however, that Manning was finally converted, through the ministry of Payzant. Clearly the single most important event of his life, his conversion was an intense experience that came at the culmination of a period of great anguish and would shape his entire future. Shortly after his conversion, Manning joined Payzant’s New Light Congregational church in Cornwallis and soon felt the “call” to preach to his fellow Nova Scotians. Although possessing little formal education, Manning began to itinerate in the Allinite tradition in 1789, preaching his first sermon in February 1790 at Onslow. He became part of a dynamic group of young men who had been “awakened” in the revivals that had swept the Maritime colonies since 1776. Over the next 20 years they would do much to transform the religious life of the region. In the New England planter communities already stirred by Alline and in the newly settled and unstable loyalist areas, Manning, his brother James, Harris Harding, Joseph Dimock*, Thomas Handley Chipman, and others carried revival to new heights – and extremes. The move toward antinomianism was perhaps a logical development for some of these new religious leaders and their enthusiastic followers. Cornwallis, an area of early support for the Great Awakening, became the centre of the “new dispensation” movement, which insisted that the “new birth” was the means by which God spoke directly to mankind, thus placing the convert beyond church ruIes, ministerial leadership, or even scriptural injunctions. In 1791 this extreme position, championed by the Mannings, Harding, and Lydia Randall, split the Cornwallis church, and its influence spread rapidly outward from there. The following year, according to a distraught Payzant, the Manning brothers “came to the Church meeting, and began to dispute, and condemn the Church Rules, and say that all orders were done away, and that the Bible was a dead letter, and they would preach without it.” The chaos and disorder – both doctrinal and social – brought on by this movement, and the uncontrolled excesses to which some of its people went, showed Manning and other would-be leaders that they had unleashed forces they could no longer control. Over the next few years there would be a rapid retreat by Manning from this extremist position. The “new dispensation” interlude greatly influenced the rest of Manning’s life, forcing him in later years to seek stability and unity within the confines of a more structured church. Manning attempted to return to full-time farming in 1792 but could not stay away from preaching. By 1793 he had moved beyond Nova Scotia and preached extensively in New Brunswick, especially in the Saint John River valley, laying the foundations for future Baptist development. There he was arrested for preaching without a licence from the government, but, according to tradition, the case was dismissed because the magistrate was so impressed by Manning’s abilities. In his lifetime Manning would see major strides made toward the removal of such restrictions, making a significant contribution in this field himself. On 19 Oct. 1795 Manning was ordained as pastor of the Cornwallis New Light Congregational Church, an uneasy alliance of “awakened” Congregationalists and Baptists. For the next few years Manning baptized adults and infants, by sprinkling or immersion, according to the wishes of those concerned. The excesses of the “new dispensation” movement, the erratic and unorthodox behaviour of Harris Harding, and the continuing instability of the evangelical churches in the Maritimes led Payzant and Manning in 1797 to urge the New Light clergy of Nova Scotia to form an association, its first full meeting taking place the following year. “The necessity of order and discipline” continued to be uppermost in the minds of the clergy, if not of their congregations, forcing them to consider a more formal organization by 1799. The late 1790s also saw an important movement toward the Baptist position of believer’s baptism by immersion. Manning was convinced of the correctness of this stand and was himself baptized by immersion in 1798, although he continued to minister to his mixed congregation. In 1800, at a meeting at Lower Granville, the association was transformed into the Nova Scotia Baptist Association, organized on the “mixed communion” plan. Although Manning is generally credited with engineering the move, it was actually Chipman who organized it, being opposed by Manning, who felt it dealt unfairly with their New Light–Congregational brethren, especially Payzant. Over the next few years, however, most of the New Light Congregational churches in Nova Scotia were transformed into Baptist churches. In a similar manner, most of the New Light clergy not only accepted the Baptist mode of adult baptism by immersion but also shifted their doctrinal stance away from the free-will approach of Alline and back to the Calvinism of their Congregational forerunners. The difficulties of leading a church composed of both Baptists and Congregationalists became painfully apparent to Manning soon after 1800. In 1807 the rupture finally came and Manning, his wife, and seven followers left the Cornwallis New Light Congregational church and formed a separate Baptist church; Manning was ordained as a Baptist preacher the following year. Over the next few years the New Light Congregational church was virtually destroyed as more and more of its adherents left to join the dissidents. It is not clear from the church records whether Manning was forced out or left of his own accord. It was perhaps no coincidence that his departure coincided with his acquisition of “some share of worldly property” (from an unspecified source) which enabled him to purchase his own farm and to be more or less financially independent for the rest of his life. He could now follow the dictates of his conscience without having to rely on the support of a large congregation. Whatever the cause or the occasion, Manning would remain, with one brief interruption, the pastor of the First Cornwallis Baptist Church until his death in 1851. Manning served as pastor of a very large area – all of Cornwallis Township, Kings County. From his home in Upper Canard, he attempted to minister to an expanding population, mainly of New England origin. In spite of the claims of later Baptist historians, the church records and Manning’s own extensive diary make it clear that the relationship between congregation and pastor was often a rocky one. Manning himself created some of the difficulties through his inability to leave behind completely his itinerant beginnings. In addition, it clearly took far longer than has previously been assumed for the church to accept fully a settled minister and Baptist doctrine. Manning’s years as pastor were tension filled, acrimonious, and at times debilitating, for both pastor and congregation. Throughout his long ministry his congregation never managed to pay him an adequate salary, a problem common in most Maritime Baptist churches of this period. Although people frequently gave gifts to their pastor – usually in kind (turnips, a sack of grain, a load of wood), rarely in money – there was no organized attempt to provide for Manning’s support. Forced at various times to farm on an occasional basis, to teach school, and to sell books, he was thus often prevented from devoting his entire time and energy to the spiritual welfare of his people. More serious was the difficulty Manning had with his people over matters of doctrine. He himself, through his extensive study and fine intellect, had a clear understanding of Baptist doctrine. There is no indication that this understanding was shared by most of those who joined his church over the many years of his ministry. Whenever a popular speaker, of whatever doctrinal stripe, passed through the township, Manning’s people flocked to hear him. At one stage he complained about “this flood of false fire, and doctrine that is prevailing among the people.” Free-will preachers were especially welcomed, even by Manning’s own deacons, suggesting that Alline’s doctrinal impact was perhaps greater and longer lasting than has been generally recognized. It was this instability within his own church, coupled with the lessons taught by the unfettered enthusiasm of the “new dispensation” movement, that led Manning to seek greater stability for the entire denomination. In this effort are to be found his greatest contributions to the growth and evolution of the Baptist movement. Nowhere is the influence more evident than in the field of education. Although Manning possessed only minimal formal education himself, he clearly had a keen, incisive mind and was by no means an ignorant man. For his entire life his reading was both extensive and catholic. As the denomination grew and the number of ministers increased, he became more and more concerned that doctrinal diversity would tear the denomination apart. Education, he felt, was the key to unity for the denomination and to greater usefulness for the emerging clergy. He was really in the forefront of the movement that was transforming Maritime society in the first half of the 19th century. The move from the anti-intellectualism of the Great Awakening and its aftermath to the new zeal for education was not an easy or a rapid one, but the change was indeed being made. His interest in, and efforts on behalf of, education as early as 1819 led to an offer for him to move to Waterville (Maine), where he was to have helped with the development of Colby College, the Baptist college there. In 1828 the steady influence of Edward Manning combined with the driving enthusiasm of Halifax Baptists such as Edmund Albern Crawley* and John Pryor* to force a rather surprised Nova Scotia Baptist Association to agree to the founding of a Baptist school as the first step toward providing potential Baptist leaders with the education that Manning so keenly felt they needed. He was elected president of the newly created Nova Scotia Baptist Education Society, a position he was to occupy for the rest of his life. The founding in Wolfville of Horton Academy, a boys’ school that from the beginning was to be open to all denominations, followed immediately. On 15 July 1830 Manning proudly laid the cornerstone of the new academy building (Horton Academy remained in operation until 1959). In 1838, in reaction to the exclusive nature of both King’s College, Windsor, and Dalhousie College, Halifax, the education society, presided over by Manning, voted to proceed to the next step – a college. By January 1839 classes at Queen’s (after 1841 Acadia) College had begun. On 16 July 1843 Manning, with his few years of formal education, presided over the first graduation exercises, for a class numbering four. He lived long enough to witness the very real impact that Horton Academy and Acadia College were to have on the denomination as a whole. Through his influence over younger clergymen, and his role in the establishment of Horton and Acadia, he contributed more than anyone else to the creation of a Maritime Baptist orthodoxy. Manning was also keenly interested in strengthening the denomination by seeking the removal of some of the legal disabilities under which dissenters laboured in the Maritime colonies. The right to perform marriages by licence and the right to incorporate were two important “rights” sought by Manning and others. Beginning in 1819 he worked in concert with other Baptists, and with the Presbyterians led by Thomas McCulloch*, in an effort to secure equality with the Church of England, an aim finally achieved within his own lifetime. Another contribution to the denomination made by Manning, with perhaps mixed results, was the successful wooing of a number of dissidents in Halifax’s St Paul’s Church (Anglican) in the mid 1820s. It was Manning, through his niece’s husband, John Ferguson, who more than anyone else drew that significant group into the Baptist fold. James William Johnston*, Edmund Crawley, John Pryor, and others would add a new and at times discordant dimension to the denomination, with far-reaching implications, politically, socially, theologically, and educationally. With Charles Tupper*, Manning was one of the first of the Baptist ministers to sense the significance of the temperance movement as it swept into the Maritime region from Maine in 1829. Immediately convinced of the correctness of the abstinence position, he led in forming a temperance society in Cornwallis and helped articulate the stand that became a virtual article of faith for many Baptist churches for nearly a century and a half. He was also the first Baptist leader to take a conspicuous interest in the history of the denomination. As early as 1812 he wrote a short account of the Baptists in the Maritimes in response to questions sent him by the Reverend David Benedict of Rhode Island, who wished to publish a history of the Baptists in North America. It was probably his awareness of history that caused him to retain so carefully his voluminous correspondence and to keep so meticulous a diary, which together form the basis for any present-day understanding of the denomination in that period. Manning also gave leadership in the move towards active participation in foreign missions. In 1814 he expressed his concerns for the “heathen in foreign lands” in a circular letter to the churches of the Baptist association, the first important plea for Baptist involvement in foreign missions. In this he was greatly influenced by his reading of American and British Baptist periodicals. He returned to this theme time after time, clearly wishing that he himself could go. His efforts led to the sending of the first Baptist missionary, Richard E. Burpee, to Burma in 1845, the beginning of more than 140 years of involvement in foreign missions. In the same important circular letter, Manning also expressed great concern for home missions. It would be at least partly through his influence and efforts that the denomination spread so rapidly in the Maritime region in the first half of the 19th century. As well as encouraging others, he himself travelled throughout the Maritime region and into Maine, founding new churches and reviving old ones. In addition to actual visits, he extended his authority throughout the Maritimes by a vigorous correspondence. When individuals or churches experienced difficulties, it was to Manning that they turned. It was he as well who kept the association in touch with Baptist development in the United States. In all of these matters, he sought to chart a moderate course for the denomination, avoiding what he saw as the twin dangers of excessive enthusiasm on the one hand and “dead formalism” on the other. Such stability as the denomination possessed by the mid 19th century was due in no small measure to Edward Manning. It is ironic that he had more success in leading the denomination than he had with his own church or family. The Cornwallis church gave him endless trouble and his family was little better. Manning’s wife, obviously disliking his frequent absences, became “ill” about 1815, suffering almost constantly from “palpitations of the heart” and “the glooms,” as Manning called her afflictions. Mrs Manning was, however, still well enough 36 years later to walk in her husband’s funeral procession. The constant fear of his wife’s imminent death, the lingering deaths of two of his three daughters, and the frequent illnesses that he had to contend with as pastor caused him to become morbidly concerned with his own health. His diary is filled with references to his physical condition and his expected death. At times his own poor health (real or imagined) and that of his wife seriously hampered his effectiveness as pastor and denominational leader. Manning’s death in early 1851 marked the end of the formative years of Baptist development. The men of his generation had seen the movement in the Maritimes emerge out of the confusion and uncertainty following the Great Awakening and the American revolution to the position of a large and stable denomination. No one contributed more to that development than did Manning. The Baptist Christian Messenger paid tribute to this remarkable leader in the letters, articles, and editorials on news of his death. The final acknowledgement of his stature came when this paper, pointing out that “the history of his life is the history of the rise and progress of the Baptist interest in these Provinces,” reported that no one was willing to take on the awesome task of writing the usual “memoir” of his life. An oil portrait of Edward Manning hangs in University Hall at Acadia (Wolfville, N.S.). ABHC, Bennett coll. ; Cornwallis, N.S., Congregational (Newlight) Church, records; Edward Manning, corr., journals, and “Reminiscences of his conversion”; N.S. Baptist Education Soc., papers; Upper Canard, N.S., Cornwallis First United Baptist Church, records. Kings County Court of Probate (Kentville, N.S. ), M21 (will and inventory of estate of Edward Manning). Kings County Registry of Deeds (Kentville), Book 5: 260. Henry Alline, The life and journal of the Rev. Mr. Henry Alline, ed. James Beverley and B. [M.] Moody (Hantsport, 1982). 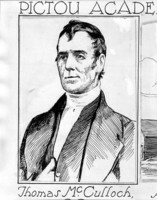 Baptist Missionary Magazine of Nova-Scotia and New-Brunswick (Saint John and Halifax), 1 (1827–29)–3 (1833); new ser., 1 (1834)–3 (1836). N.B. Baptist Assoc., Minutes (Saint John; Fredericton), 1822–46. The New Light letters and spiritual songs, 1778–1793, ed. G. A. Rawlyk (Hantsport, N.S., 1983). N.S. and N.B. Baptist Assoc., Minutes (Halifax; Saint John), 1810–21. N.S. Baptist Assoc., Minutes (Halifax), 1822–46. N.S. Baptist Education Soc., Report (Halifax), 1832–51. John Payzant, The journal of the Reverend John Payzant (1749–1834), ed. B. C. Cuthbertson (Hantsport, 1981). Christian Messenger (Halifax), 1837–51. The Acadia record, 1838–1953, comp. Watson Kirkconnell (4th ed., Wolfville, 1953). M. W. Armstrong, The great awakening in Nova Scotia, 1776–1809 (Hartford, Conn., 1948). Bill, Fifty years with Baptist ministers. J. M. Bumsted, Henry Alline, 1748–1784 (Toronto, 1971). J. V. Duncanson, Falmouth – a New England township in Nova Scotia, 1760–1965 (Windsor, Ont., 1965; repr., with suppl., Belleville, Ont., 1983). Eaton, Hist. of King’s County. E. L. Eaton, “The Sheffield farm and other properties in Cornwallis Township” (typescript, 1961; copies at Acadia Univ. Library and PANS). Levy, Baptists of Maritime prov. R. S. Longley, Acadia University, 1838–1938 (Wolfville, 1939). B. M. Moody, “Joseph Howe, the Baptists, and the college question,” The proceedings of the Joseph Howe Symposium, Mount Allison University, ed. Wayne Hunt (Sackville, N.B., and Halifax, 1984). Repent and believe: the Baptist experience in Maritime Canada, ed. B. M. Moody (Hantsport, 1980). E. M. Saunders, History of the Baptists of the Maritime provinces (Halifax, 1902). B. 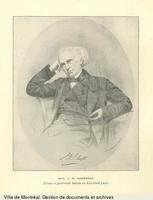 [M.] Moody, “From itinerant to pastor: the case of Edward Manning (1767–1851),” Canadian Soc. of Church Hist., Papers (Montreal), 1981: 1–25. G. A. Rawlyk, “New Lights, Baptists and religious awakenings in Nova Scotia, 1776–1843,” CCHS Journal, 25 (1983): 43–73. Barry M. Moody, “MANNING, EDWARD,” in Dictionary of Canadian Biography, vol. 8, University of Toronto/Université Laval, 2003–, accessed April 24, 2019, http://www.biographi.ca/en/bio/manning_edward_8E.html.